Violence, sectarianism, oil politics. These are the predominant themes covered in news and political debate when it comes to Iraq. Add to this, during the recent election campaign in Iraqi Kurdistan, issues that ranked high among candidates included promises to defend Kurdistan against its enemies and to integrate the disputed city of Kirkuk into Kurdish territory. Apart from such appeals to nationalist sentiment, it seems as if one major issue goes unnoticed: the creeping process of neoliberalisation. Especially after the US-invasion in 2003, neoliberal transformation took unprecedented forms throughout Iraq. By the time Paul Bremer, head of the Coalition Provisional Authority left in 2004, 100 regulations and orders were implemented that paved the way for opening the country to free trade and a large privatization campaign. Soon after the implementation of these policies, violence gained ground in central and southern Iraq. However, the Kurdish region that had already implemented its governing structure since the establishment of a no-fly zone in 1991 remained relatively safe. Thus, on the look-out for local elites to support their vision of Iraq as a free market economy, the US and its allies saw in the Kurdish Regional Government (KRG), or rather in its two ruling parties the KDP (Kurdistan Democratic Party) and the PUK (Patriotic Union of Kurdistan), strategic partners for the implementation of their projects. Since the 1990s, the KDP and PUK cannot only be considered political parties. They control nearly all economic activity in Kurdistan through their business concerns (e.g. the Nokan Group that belongs to the PUK, and Korek that belongs to KDP). Kurdistan became the gateway for major foreign companies, among them WesternZagros and ExxonMobil, to the rest of Iraq. To attract foreign direct investment the KRG implemented in July 2006 laws in order “to create a climate for promoting investment in the Iraqi Kurdistan Region”. This process was inevitably accompanied by a certain discourse. The KRG started to present itself as a US-friendly region, launching the “the other Iraq” campaign. But these campaigns do not confine themselves to presenting Kurds in the guise of reliable western allies, they also deepen the alienation between Kurds and Arabs within Iraq. In retrospect, the process of neoliberalization has not only drastically changed the economic structure of society but it also has a deep and dangerous effect on larger social structures that have the power to alter people’s mindsets. Today, the process of neoliberalisation in Iraqi-Kurdistan is in full swing and there seems little consciousness within society of the disastrous impact this might have for Iraqi society as a whole. Neoliberalization is hegemonically depicted as a project of modernization and progress. 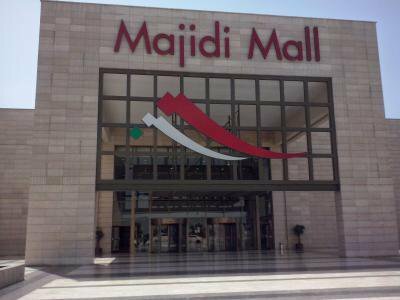 “Majidi Mall Shopping Centre serves Erbil’s residents as an important centre of amusement, fashion and various food delights, as well as shopping. It is a modern institution existing in harmony with the society, respecting the traditions in which daily trends and the future are shaped." So, Majidi Mall is not merely about shopping. The mall aims to create and feed into the desires among Iraqi-Kurds to become consumers and thus part of modernity. Modernity in this understanding first and foremost corresponds to what is imagined to be a western lifestyle. Entering Majidi Mall feels like entering a different world with its own rules, alien to the rest of the city. First of all, the impressively clean, marbled, imposing and luxurious architecture stands in stark contrast to the outside dusty and (at this time of the year) hot city. Moreover, everything is under control: music, the temperature and the people allowed entry into the mall. While the security guards at the entrance of each mall stress that everyone is allowed inside unless they carry any weapons, observing the entrance for a while reveals something rather different. Looking distinctly poor (however this is defined) to the security guards disqualifies you from entering. In fact, it soon becomes clear that the malls do not seem to be made for (lower class) Iraqi Kurdish citizens. While it is normal to speak Kurdish at the traditional bazaar, almost everyone speaks English and questions in Kurdish are replied to in English. “Enjoy your coffee” offers the waiter of one of the coffee shops in the mall when I order my coffee in Kurdish. In other shops, the vendors do not even seem to understand Kurdish - I had to translate into English for a Kurdish couple who were desperately seeking answers on some product. So the question arises, who are these malls built for? For Kurds and Kurdistan? The employer of Hewa-Group, the company that was engaged in building Majidi Mall, has his own explanation: “We are proud of Kurdistan. Some think that we are going to be like Dubai soon. 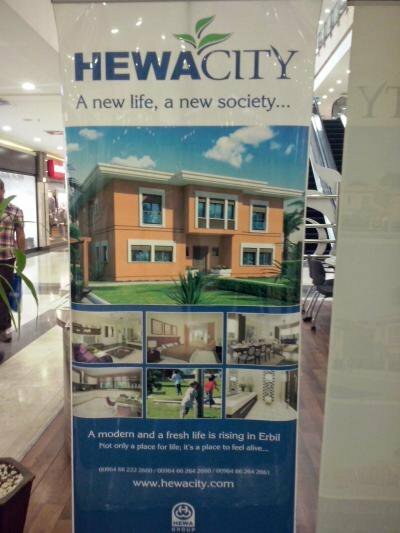 But I tell you we will be even better than Dubai.” Praising the latest project of Hewa-Group, Hewa City, a gated community that offers modern housing in close proximity to Majidi Mall, he seems in thrall to the future of Kurdistan as a hypermodern country. His argumentation thereby fits neatly into a Kurdish nationalist discourse that now aims to legitimise the neoliberal, urban reshaping of the three major Kurdish cities (Dohuk, Erbil and Sulaimaniya). Kurdish nationalism historically might have been an ideology that strengthened resistance to the Iraqi Baathist dictatorship, but this same ideological tool is now employed in the interest of the small, political business elites who are the main profiteers of the economic boom. In this context, the shopping mall offers the appropriate space for average middle class Kurdish citizens to experience some highly praised western style modernity through the consumption of the advertised products in the mall. And, even if it is not about actually buying products (as it is not affordable for everyone), it is about people experiencing the space of the mall as the imagined, modern western ideal of amusement and joy. The 'enjoying' of the mall, however, while valorising all that is seemingly western (European and American), seems to go hand in hand with the internalization of a western racist mindset. Buying products from foreign, western brands, or if this is not affordable just going window shopping in the mall, is also a process of building yourself a quasi-western identity. Imitating them begins to merge closer to being them. The other side of the coin is devalorizing and making life dangerous for the increasingly large number of south-east Asian workers on whose backs most of the 'reconstruction' is done. Places where Asians gather at the weekends on their days off, such as the “Baghi Geshti” (Geshti Park) in Sulaimaniya, are largely avoided. On the increase too is the view of Kurdish workers from Syria and Turkey, hired in the low-paid sector of the reconstruction or service industry, as inferior and of lesser value altogether. The bazaar as the authentic space of Kurdish culture ? Standing in contrast to the shopping mall is the old bazaar, familiar to Iraqi Kurds as a public space for shopping. The bazaar is usually crowded, loud and in summer time too hot to linger. While the majority of Iraqi Kurds used to frequent both the bazaar and the shopping malls simultaneously, there exist different intentions, purposes and expectations for going to one or the other place. 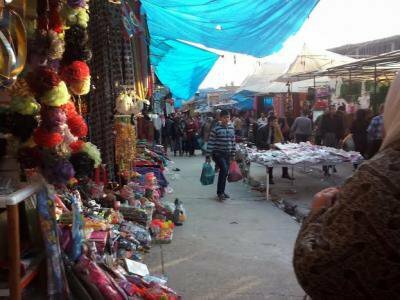 Going to the bazaar is a daily activity in order to buy affordable products, to socialise and see friends (mostly for males though). Visiting (literally) the shopping mall is on the other hand a rather special event. People go with the intention of enjoying their time in an environment that is imagined as quiet and harmonious. For regular upper-class Iraqi Kurdish shopping mall visitors, going to the bazaar migth detract from their modern, western lifestyle - though interestingly there seem to be increasing efforts by the KRG to re-produce the space of the bazaar as an “authentic” oriental place inheriting Kurdish culture. This self-orientalisation has been especially visible in the capital of the Kurdish region, Erbil, which became the 2014 Arab Tourism capital. Advertisements on the Arab channel MBC4 exactly play into the image of Erbil as the perfect mixture of modernity and authentic, ancient “Mesopotamian” culture. In fact, the old bazaar, especially the citadel bazaar in Erbil is being refurbished according to western aesthetic standards of an “oriental, old” space where mostly Americans and Europeans are supposed to enjoy an 'experience'. Feeding into this self-orientalizing practice, the government tried to ban the mobile vehicles of vendors who cannot afford to have a shop. According to one vendor, the banning of the vehicles was met by significant resistance. Vendors demonstrated against these laws, and for now have managed to stay on at the baazar. Nonetheless, many of the demonstrators were later rounded up by security forces and imprisoned. In Sulaimaniya a different approach was taken, laws were put in place to regulate the mobile vendors, they can now sell their products for the duration of 3 hours, starting from 4 pm. Yet, people on the ground do make efforts to prevail against these repressive politics, as they try to reclaim space in the city for the free use of everyone. Currently, activists in Sulaimaniya aim to turn a local old tobacco factory into a cultural centre. The aim is to create a non-commercial, inclusive, alternative space that is supposed to provoke critical political and social discussion on Iraqi-Kurdish society. Being a local initiative, the realization of this plan is still very much dependent on official institutions. As other business companies are also interested in the land for other purposes, the project at the moment is endangered and is considered only possible with sufficient pressure from below. It becomes clear that the true danger of neoliberalism, in Iraqi-Kurdistan and beyond, lies in the twisted and invisible way in which processes of neoliberalisation are constructed not only as harmless, but also as the desirable way forward. However, the experience of the marginalized population of Iraqi Kurdistan, particularly those in rural areas, show how dangerous and deadly these processes of neoliberalisation are.